Because parking spots in the Los Angeles area can often seem like a rare and valuable commodity, some people may be tempted to misuse a disability parking placard (also referred to as a handicap parking placard). However, unlawful use of a disability placard is a criminal offense under California Vehicle Code Section 4461 VC that can result in significant penalties for those convicted. Lending a validly issued disability placard to someone who is not authorized to use or own such a placard. Knowingly allowing another person who is not entitled to use a disability placard to use one. Driving someone else’s car that has a valid disability placard and then parking in a reserved handicap parking spot. The restrictions in California Vehicle Code Section 4461 VC do not apply to anyone actively transporting someone who is disabled. A man borrows his mother’s car to run some errands, including picking up her prescriptions. His mother is disabled and has a valid handicap parking placard. The man cannot find a parking spot so he parks in a handicap spot for 10 minutes while he quickly runs into the drugstore and picks up the prescriptions. The man could be charged with misuse of a disability placard in violation of California Vehicle Code Section 4461 VC. In another example, the same man is again driving his mother’s car which has a valid disability parking placard, however this time he is taking his mother to a doctor’s appointment. The man drops his mother off at the front of the medical center and then parks the car in a specially marked handicap spot. In this scenario, the man would not be guilty of misuse of a disability placard because he was actively transporting someone who was disabled. As described above, if the defendant was actively transporting a disabled person at the time he or she used a disability placard, he or she would not be guilty of unlawful use of the placard. In addition, if another person uses the defendant’s valid placard without the defendant’s knowledge, the defendant would not be guilty of this offense. One must knowingly misuse or allow someone else to misuse a placard in order to violate the statute. 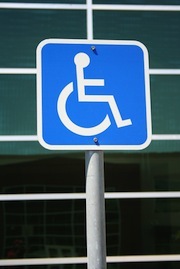 Unlawful use of a disability placard can be treated as either an infraction or a misdemeanor. If this charge is reduced to an infraction, the penalty would be a court fine between $250 and $1,000. If charged as a misdemeanor, the defendant can be sentenced to up to six months in jail in addition to court fines and any other conditions of probation that a judge may consider appropriate. In addition, the court can impose a $1,500 civil penalty. Unlawful use of a disability placard is a criminal offense that can expose those convicted to a variety of criminal penalties. If you or someone you know have been charged with unlawful use of a disability placard, it is very important that you speak with a knowledgeable and experienced Los Angeles Criminal Defense Lawyer right away. Los Angeles Criminal Defense Attorney Michael Kraut is a former Deputy District Attorney with over 14 years of prosecutorial experience who is highly regarded by judges, district attorneys and law enforcement officers as a skilled criminal litigator. Mr. Kraut works tirelessly to ensure his clients receive the best representation possible and often his early involvement and intervention in a case can prevent a criminal filing altogether. For more information about unlawful use of a disability placard, and to schedule your free consultation, contact Los Angeles Criminal Defense Lawyer Michael Kraut at the Kraut Law Group located at 6255 Sunset Boulevard, Suite 1480, Los Angeles, CA 90028. Mr. Kraut can be reached 24/7 at 888-334-6344 or 323-464-6453.